This new Huy Fong Sriracha Mug is the spiciest way to start of your day. This mug will hold 20 ounces of your favorite beverage - your morning cup of Joe, afternoon tea, or straight Sriracha! The mug is primarily red with a green handle and green inside. 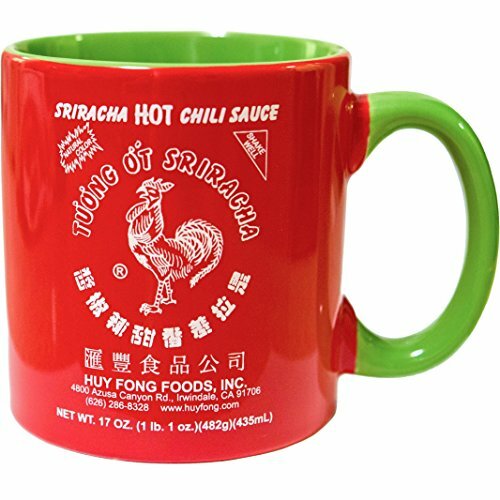 The mug contains the Huy Fong Foods Sriracha label on the front and back of the mug. Red Mug with Green Handle and Green Inside with Huy Fong Foods Sriracha Label On Both Sides. Start Your Morning Right By Drinking Your Coffee Or Tea From This Sriracha Mug! If you have any questions about this product by Sriracha2Go, contact us by completing and submitting the form below. If you are looking for a specif part number, please include it with your message.